For nearly seven years, The Lord of the Rings: The Card Game has invited players from across the world to enter J.R.R. Tolkien's mythic land of Middle-earth and embark on their own epic journeys through this iconic landscape. Banding together, these players must work together to fight back against the machinations of Sauron and his minions. 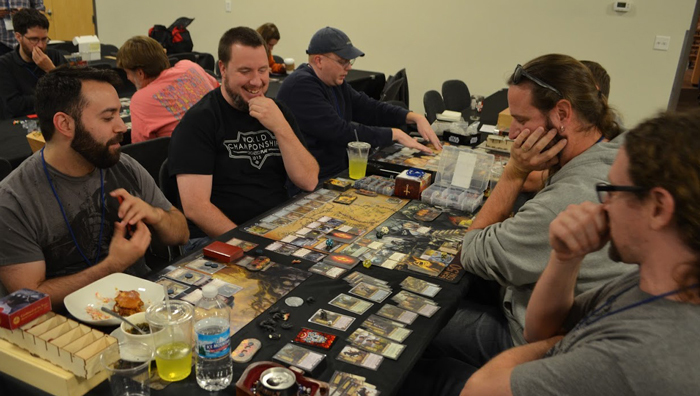 Recently, many of these players came together to celebrate their love of the game at the first fan convention dedicated to The Lord of the Rings: The Card Game. Developer Caleb Grace was in attendance and is here to recap his experience at the very first Con of the Rings! During the weekend of October 12 – 15, I had the privilege to attend the first ever The Lord of the Rings: The Card Game convention: Con of the Rings. 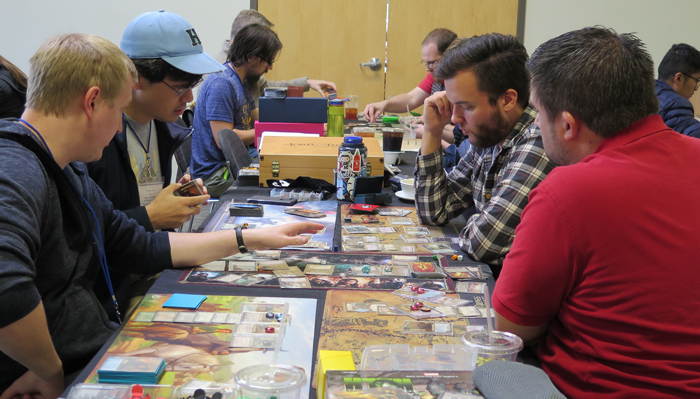 It was organized by a local group of players known as Free Men of the North, and hosted by the Fantasy Flight Games Center in Roseville, MN. Prior to the event, the Free Men created a Kickstarter campaign in order to make tickets available online and gauge interest. Within a week, they had surpassed their initial goal and reserved the event hall at the Games Center. A short while later, they had to increase their maximum attendance cap to satisfy player demand. Community members from all over the United States (and overseas!) were eager for the opportunity to come together and enjoy The Lord of the Rings: The Card Game together. For myself, I was excited for the opportunity to meet players face-to-face where I’d only exchanged emails before. Some people I had met previously at Gen Con, but for many others it was my first time getting to shake hands and talk. I was amazed by how friendly and enthusiastic all the attendees were. I already knew that The Lord of the Rings: The Card Game has a fantastic player base, but this was some next-level kindness. Local players opened their homes for out-of-town visitors to stay for free. They provided transportation to and from the airport. And in the case of one young player, several attendees gave him the gift cards they’d won as prizes that weekend so he could grow his fledgling collection. In addition to all of this generosity, there was an palatable atmosphere of fun that permeated all three days of the convention. You could feel it the moment you walked into the event hall where the Con of the Rings was held. Eighty plus players were divided into numerous groups, spread across the entire space, playing all kinds of scenarios. All of them were having a great time playing the game—many of them playing with people they had just met! The event organizers had created a schedule for the convention. The main event, which ran across all three days, was a group effort to defeat all the adventures in The Lord of the Rings Saga Expansions. Over the course of the weekend, Con of the Rings attendees took The One Ring all the way from Bag End to Mount Doom, where they successfully cast it into the fire to defeat Sauron. One player even posted a picture of their copy of The One Ring torn to pieces when they destroyed it at the end of the campaign! To promote this large group saga campaign, the Free Men created an enormous achievement board that they posted on the wall of the event space. It had the names of all twenty adventures, listed in order and spread across each day of the convention. When a group successfully completed a scenario, they could sign their names next to that adventure, indicating that they had defeated this stage of the campaign. To add even more fun, the Free Men created custom achievements for each adventure to challenge players, ranging from surviving eight rounds in The Black Gate Opens to defeating the Balrog by sacrificing Pippin in A Journey in the Dark. The event was culminated and commemorated by a large group photo. This more than anything spoke to me of the togetherness felt by everyone in attendance. Being a family man with young kids, I often groan about group photos, but this was something else. Everybody wanted to be in this photo to remember being there. When it was time for the picture, everybody paused their games and squeezed into frame in order to get the shot. The image speaks for itself. Thinking back on it now, I’m still blown away by how excited everyone was to play the game for hours on each day of the convention. I typically get to play my fair share of The Lord of the Rings: The Card Game in the office, but there was such enthusiasm among the players there that I had to join in. I ended up playing several games of 2v2 using The Woodland Realm and The Wizard’s Quest Custom Scenario Kits. Since these products are a very recent addition to the game, it was encouraging to see how much people enjoy playing with them. I’m excited to see if this format catches on with more players once the products go on sale through our POD factory! My competitive matches were the highlight of the convention for me, especially when I got to play with people I’d never played with before. I got to see a lot of different decks: there were some classic builds, like Hobbits, Dwarves, and Outlands, as well as some more recent additions, such as Dale and Woodmen. In each case it was fun to see how each individual built and played their deck a little different from everyone else. And these were just a small sample of the much greater variety of decks being played all weekend. Fantasy Flight Games developers Caleb Grace and Matt Newman enjoy The Lord of the Rings: The Card Game with fans during Con of the Rings. For my part, I played three of my own decks over the weekend: a mono-Spirit Caldara build, tri-sphere Silvans, and a Lore & Tactics trap deck. Each of them held their own and offered my partner some help, but my most valuable contribution to my competitive matches was probably the encounter deck I built using the quick build rules and a single copy of The Woodland Realm. It included a lot of small, low engagement cost enemies to harass the opposing team, while the locations and treacheries drove their threat higher. When they eventually reached Stage 3, they found its quest points was equal to the threat value of their highest threat player. That was typically somewhere in the mid-40s by then! We usually completed our quest first. Throughout the weekend, attendees would occasionally pull me aside to express their love for The Lord of the Rings: The Card Game. This was easily the best part of the convention for me, because of how rewarding it was to see people enjoy my contributions to the game. Normally I get my player feedback from online forums, but that lacks the personal dimension of sharing the experience in person. To be at Con of the Rings and interact with the players face-to-face was as invigorating as freshly baked lembas. By the end of the weekend, it seemed like many of us were sad that it had to end, and we consoled ourselves by saying, “See you next year.” I’m happy to say that the Free Men of the North are already planning the second Con of the Rings, and I look forward to it. They did a fantastic job working with the Games Center and the community to organize this event, and they deserve a huge “thank you” for their effort, especially because they did it all completely as volunteers! So I want to say “thank you” to the Free Men, the Games Center, and everyone who attended Con of the Rings this year. I hope to see you next fall!